Talk about a star studded Extravaganza! I thoroughly enjoyed this movie as well as the extras on the DVD (which include the "red carpet" at the movie's premier). Curiously, it's small film - in terms of the setting, and story, and yet the who's who in 1930s Hollywood are featured in it. Quite an interesting film. @Klaus: You make a good point; the overall feel of the film, when you take into account the level of star power involved, is small. Maybe that's what makes it so good! Thanks for the comment. It's appreciated. I think that's exactly it. It really is a showcase for acting, dialogue. It reminds me of any number of Woody Allen films from the perspective of the plot - which is often secondary to the dialogue. The only weakness in the film was Garbo’s over the top performance and the some sloppy editing - apparently they re-shot some of her scenes (and it was pretty obvious which ones). On the other hand, I thought Joan Crawford stole every scene she was in - simply brilliant! I'm actually a Garbo fan, but I will agree that this wasn't her strongest film. As for Crawford: absolutely! She came off as very alluring, very sexual, which really shocked me (seeing as this was early 30's). Of the two, Crawford is definitely the strongest. 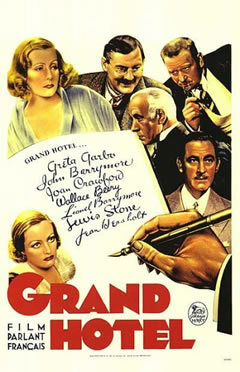 I have not seen Grand Hotel and although this review was very convincing and entertaining probably never will, but I was wondering do you think this films story would hold with a younger audience who aren't acquainted with films of this ilk?